A powerful account, by Israeli peace activist Miko Peled, of his transformation from a young man who'd grown up in the heart of Israel's elite and served proudly in its military into a fearless advocate of nonviolent struggle and equal rights for all Palestinians and Israelis. His journey is mirrored in many ways the transformation his father, a much-decorated Israeli general, had undergone three decades earlier. Alice Walker contributed a foreword to the first edition in which she wrote, "There are few books on the Israel/Palestine issue that seem as hopeful to me as this one." In the new Epilogue he takes readers to South Africa, East Asia, several European countries, and the West Bank, Gaza, and Israel itself. Miko Peled is an Israeli peace activist who spends his time between Jerusalem and San Diego. Born into a strongly Zionist family in Jerusalem, as a young man Peled witnessed the transformation of his father, Gen. Matti Peled, from a well-known leader in Israel's military to a strong peace activist. 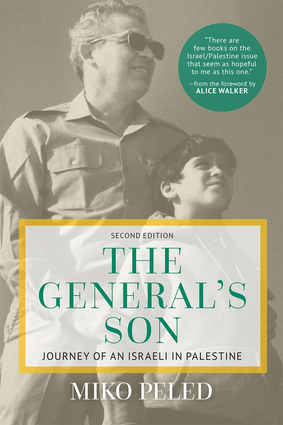 The General's Son has been translated into numerous other languages and Peled, a gripping public speaker, has lectured around the world in his campaign to promote justice, democracy, and equal rights for Palestinians and Israelis. Alice Walker is an activist and a Pulitzer Prize winning author. She has written more than 30 books, including The Color Purple, The Temple of My Familiar, and The Way Forward is With a Broken Heart.